The introduction of fifth-generation capabilities like the F-35 is changing the nature of the RAAF. 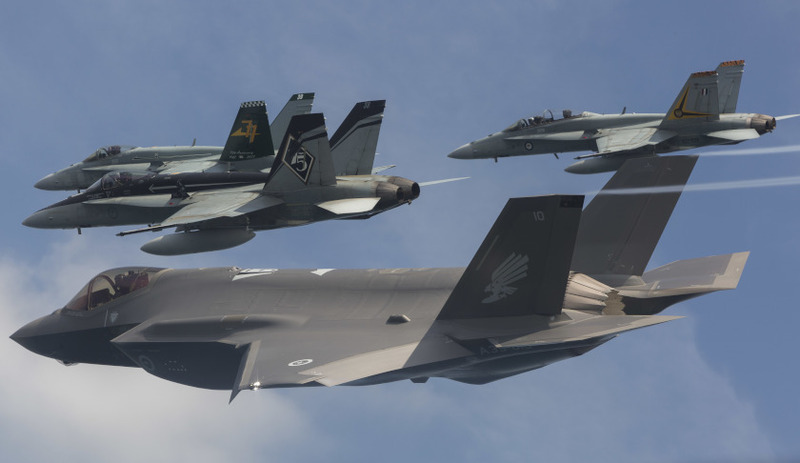 Balancing the different operating and sustainment requirements of legacy platforms like the F-18 Hornet and JSF is critical to meeting government’s mission requirements. For Air Commodore Mike Kitcher, Commander Air Combat Group, the arrival of the F-35 Joint Strike Fighter in early December was the culmination of a decade of project development and acquisition, as part of Australia’s $17 billion investment in history’s largest defence project. 75 Squadron is based up at RAAF Tindal in the Northern Territory. No. 2 OCU is the convert or the operational conversion squadron currently for the Classic Hornet. 81 Wing will be transitioning as we speak from the Classic Hornet to the F-35. There’s two other Wings in Air Combat Group. No. 78 Wing basically looks after two key factors, our Hawk training aircraft, our operational or intro fighter aircraft, which consists of 79 Squadron over at RAAF Base Pearce and 76 Squadron here at Williamtown. 78 Wing will also, over the next six to 12 months, become responsible for delivering a tactical air wing capability for the Air Force and the ADF as well. That’s 81, 78 Wing, and then 82 Wing is based up at RAAF Amberley, near Brisbane. 82 Wing has a squadron of Super Hornets. They’ve had those since about 2010, and very recently introduced the EA-18G Growler aircraft as well. 1 Squadron with Super Hornet, and 6 Squadron with the Growlers. The Growlers will be declaring IOC in the very near future, I would imagine, as our newest capability. I think it’s the way of thinking, or if you like, a Jericho way of inculcating a way of thinking, I think has been... Whilst there’s still a way to go, don’t get me wrong, that has been as successful as the individual projects that make up the guts of the Jericho system. Providing the air combat capability means we need to be able to contribute to a coalition operation such as that. Air Combat Group also has to be able to provide a standalone air combat capability for Australia and Australia’s interests in the immediate region, which may not involve a coalition operation. We have to be able to operate by ourselves and with other elements of the ADF, and then, of course, we've got to be positioned to contribute. Whilst we hope it never occurs, we need to be able to contribute to high-end coalition warfighting as well, which would be a high-end air combat capability. There’s multiple roles in the air combat space, and it’s a challenge to keep our ground crews and technicians and our aircrews current and competent in all of those roles such that we've got a fairly robust capability for government to use, should they choose to do so. The introduction of the Super Hornet was a real eye opener for lots and lots of reasons to do with capability, but also from a security environment perspective, was a real eye opener for pretty much all of us. Since that, adding the Growler and the F-35 to that means that we... That presents a challenge when you start to try and operate with other coalition force or other assets that may not have that level of experience. I think that will be an interesting challenge over the next 10 years or so, especially when you look at other coalition nations who might be, for example, slightly more advanced down the track than we are on that journey at the moment, and the challenges they have. I think that we’ll be sharing exactly the same sort of challenges. The full Defence Connect podcast interview with Air Commodore Mike Kitcher, Commander Air Combat Group, is available here.